Real role models do what’s right and Darrick Branch is a good example. Coming from football stardom in Texas, Hawaii and the NFL, this entrepreneur wanted to give back to the community he now calls home. He founded Hawaii Team Sports with some friends to teach Hawaii’s youth to stay out of trouble, drugs and alcohol. Hawaii Sports Network runs many events including a football combine, basketball tournaments, charitable giving and in-school speaking engagements. Hear how his mother formed the backbone of his ethics and how his faith led him to this cause. Darrick, welcome to our show. You were blessed to experience playing football professionally, many guys’ goal and dream. Can you tell us what that experience was like? What does it take to be a professional athlete? What made you stand out from the rest? Do you think attitude helped you through life to help you adapt to different places and people? What made you choose Hawaii to play ball? What are your thoughts on education and athletes? How do you feel your sports career helped your business drive? What’s the story behind Hawaii Team Sports? What’s the impace you’ve experienced from Hawaii Team Sports? Hawaii Team Sports does an event called School Jam, could you tell us more about this? How were you inspired to do an activity like School Jam? During Thanksgiving you will be doing an event called Gobble Giveaway with Fast Kine Tanning. What is the gobble giveaway? Could you share with us any success stories of your promotional events and how it had impacted children’s lives? You’ve played for many good and great coaches. What made the great coaches stand out? Do you have any motivational stories or quotes that inspired you when your team was falling behind and needed to pick up the pace? Could you tell us about your training and clinics that you offer for children? Are there plans for an extension of your company in Texas? What message would you like our listeners to receive from this discussion? Born February 10, 1972 in Dallas, Tx. Member of the 1988 Texas State Football Champion Carter Cowboys featured in the movie Friday Night Lights. State Champion in the 110m high hurdles. Held state record for 3 years with a time of 13.42 seconds. Set the state record for most three pointers in a Texas high school basketball game(12). Received a full athletic scholarship to the University of Hawaii in 1989. Selected twice as a member of the All WAC team as a wide receiver and kick returner. Finished his senior campaign at the University of Hawaii ranked fifth in the nation in kickoff returns and 2nd all time in school history in average yard per reception and kick returns. Drafted in the 7th round of the 1993 NFL Draft by the Tampa Bay Buccaneers. In 1994 played for the Buffalo Bills. In 1995 was signed by the Toronto Argonauts of the Canadian Football League. Lead the team in receptions, TD’s, and kick returns breaking several team records including longest kick off return in team history. After 8 games was signed by the defending Super Bowl Champion San Francisco 49ers. Played with the 49ers during 1995 & 1996 seasons. 1997 traded to the Denver Broncos. 1998 played in NFL Europe for World Bowl runner up Frankfurt Galaxy. 1999-2001 member of the expansion Arena Football Team Buffalo Destroyers. Was named team MVP and league offensive new comer of the year in 1999. Gained more than 2000 all-purpose yards in 1999. 2001 signed with the BC Lions of the Canadian Football League. 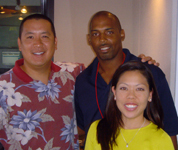 2002 served as account executive and team consultant for the Hawaiian Islander Arena Football Team. Currently is one of the owners and director of local sports marketing and events company known as Hawaii TEAM Sports. Wants the world to know that I will give my heart and soul for us all to one day feel the joy of accomplishing your ultimate goal.